Today we watched Troy. If you haven’t seen it, you HAVE to watch it. The guy is amazing! He did all kinds of tricks – pouring a drink using only a menu, making goldfish appear in a watercooler, raining money from the sky… His aim in life is to make people happy, and the extraordinary experiences he conjures up out of ordinary situations and objects really do bring smiles to peoples faces. It makes me think about creating joy in the mundane, and how we do that… We all have the capacity to make a moment special, whether it’s my Grandma making waterlillies out of napkins, Andrew creating heart shaped fried eggs for breakfast, or my brother making up a funny song about all his friends. What can you do this week to make someone’s day? 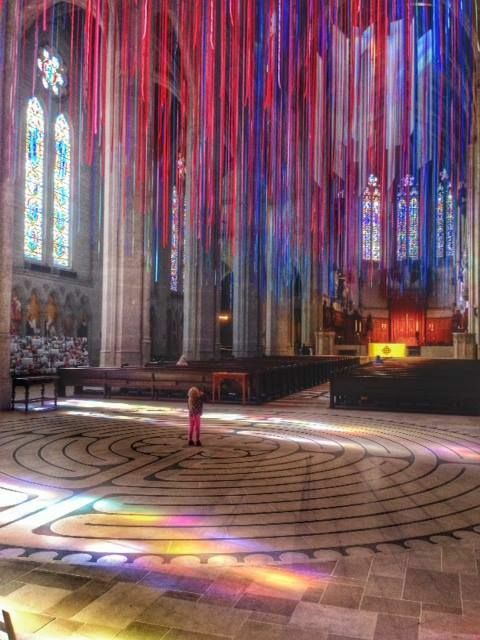 How beautiful is this installation in a cathedral in San Francisco? I found the image via A Cup of Jo.